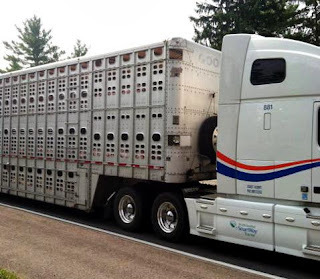 This photo is of a tractor trailer truck bringing pigs to slaughter. I was about to leave Bucknell when I heard them squealing at a red light about 500 feet away. I ran down to the street to get closer and snap this picture. 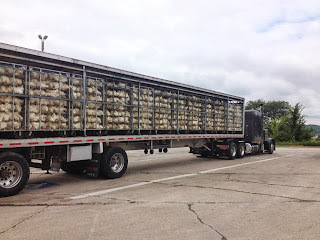 Their squealing was incredibly loud, and the smell from the truck was pungent. I've seen just as much footage of factory farms as the next activist -- Earthlings, Farm To Fridge, Meet Your Meat -- I've seen it all, but nothing was like being face to face with this cruelty in person. 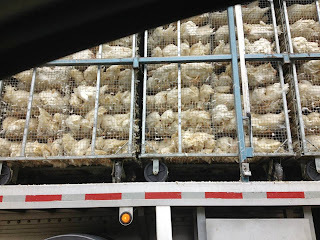 Living in Boston, I'm not really close to farms, my only exposure to this cruelty is in booklets or online. After seeing this truck, I was really shaken up, I had to sit in my car for a few minutes to pull myself together before I took off for my second school of the day. After seeing this firsthand, I felt highly motivated to get out there and work as hard as possible for these animals. At a rest stop in central Illinois, I saw this truck full of chickens bound for slaughter. I walked by it to get some pics. 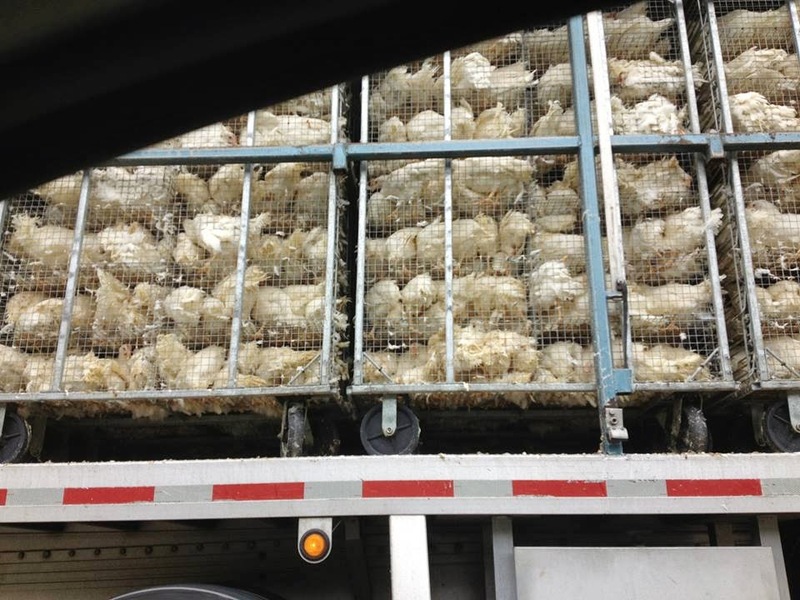 A man standing by a different truck for a freight company yelled out, "After seeing stuff like this, you almost want to go vegetarian." Surprised to hear that, I told him that I was veg. He then let me know that he's cut pretty much all meat from his diet, though he's still working on pork. This has been the result of seeing too many such trucks too close. It goes to show that we never know when we're going to find an unexpected ally.